Last Monday I sat on a plane at Louis Armstrong International Airport, Brian’s hand in mine as we taxied down the runway and lifted off, on our way home to Charlottesville. Out the window I watched a city that I love dearly fall away, nostalgic and missing New Orleans already. We’d arrived Friday morning to heat and humidity that we won’t (hopefully) see in Virginia for another two months. After checking bags at our hotel, changing into shorts and slathering on sunscreen we set out into the city with two friends who’d joined us for four days of exploring, absorbing, listening and, most importantly, eating. As the veteran visitors, Brian and I had laid out an agenda based on food - our nine meals were carefully scheduled and the rest of the trip was woven loosely around their locations. There were muffalettas and seafood po-boys, chicken andouille gumbo and spicy jambalaya, raw oysters and bags of boiled crawfish, black ham biscuits and fluffy omelets served with fries, powdered beignets and pecan-laden pralines. We sipped Pimm’s Cups as we strolled the French Quarter, cooled off with a creamy Bourbon Milk Punch at Bourbon House, swirled ice in our vodka tonics while listening to set after set of incredible jazz. We walked and biked between those meals to help counter the indulgence of the weekend, oftentimes feeling that what we really, really needed was to find a shady spot to stretch out horizontally for a nice, long nap. As New Orleans disappeared beneath a bank of hazy clouds last Monday I found myself thinking that we could live there, Brian and I, in a cute Creole cottage just downriver from the French Quarter. We’d paint our home in shades of blue and grey with a vibrant yellow, or maybe eggplant, accent around the windows and doors. There would be bikes leaned up against the side of the house, one with a basket, ready at a moment’s notice to be ridden into the Quarter for lunch or to the Crescent City Farmer’s Market for fresh, local seafood and produce. Our yard would be tiny, just big enough for a vegetable garden and a stone terrace with an umbrella-covered picnic table. We’d string lanterns from the trees and host crawfish boils on that terrace, invite guests who would wear jaunty hats and sip frosty cocktails as they unconsciously swayed to the sounds of Doreen’s clarinet wafting from the stereo. It is a lovely dream, one that I could see becoming a reality one day if we could just find a way to get used to the stifling heat. And the cockroaches - complete terror only scratches the surface of the affect that those little buggers have on me. And the city’s status as the murder capital of the USA... Minor details, since I already have the biggest obstacle solved - vegetables. Did you notice that my list of traditional NOLA fare does not include even a hint of green? While we happily consumed fried / buttered / sugared food for four full days, I believe that four days must be the limit. For as I dreamt about our little blue Creole cottage and crawfish boils and lanterns strung from trees and clinking glasses of frosty beverages, I managed to squeeze a giant bowl of homegrown greens onto the linen-covered table in the middle of that backyard terrace. 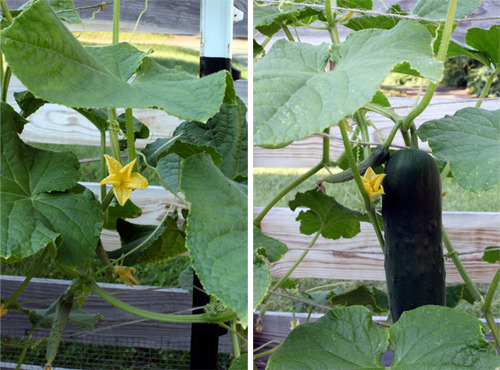 A vegetable garden would be an absolute necessity to our New Orleans lifestyle. The next day, back at work in Charlottesville and fully submerged in reality, Brian and I met a friend for lunch at Feast. I ordered a mixed salad plate, and while I couldn’t stop talking about the wonderful food in New Orleans, my mind was distracted by how amazingly satisfying the plate full of veggies in front of me was. And on Saturday, at our own City Market, we filled our basket with all the green we could get our hands on - two heads of lettuce, two bunches of both kale and collards, two pounds of asparagus. I plan to share some of our favorite New Orleans-inspired dishes here on Bella Eats in the next month or two (along with some photographs from our trip! ), but just had to give our systems a break this last 10 days. 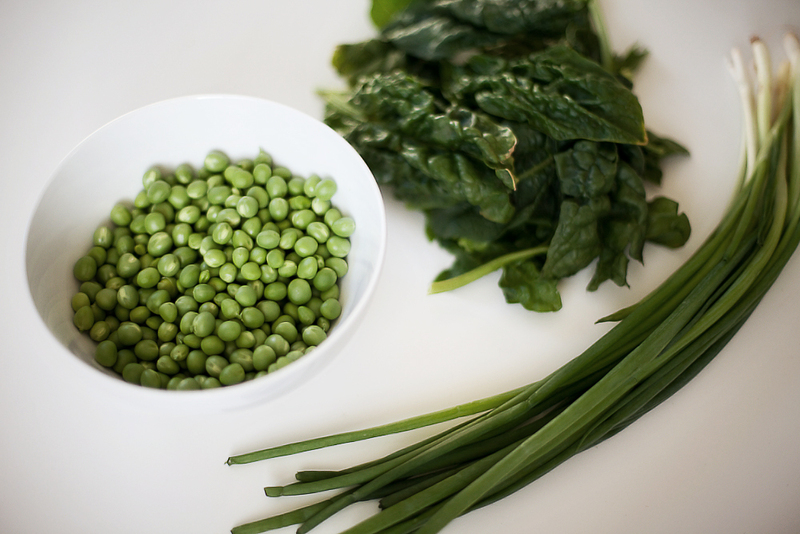 I'd originally thought that a full month of NOLA fare on this little blog could be fun, but have decided instead to spread those rich, indulgent dishes out, to balance them with recipes like this side of wilted spinach tossed with fresh peas, garlic and scallions. It's better this way, I promise. 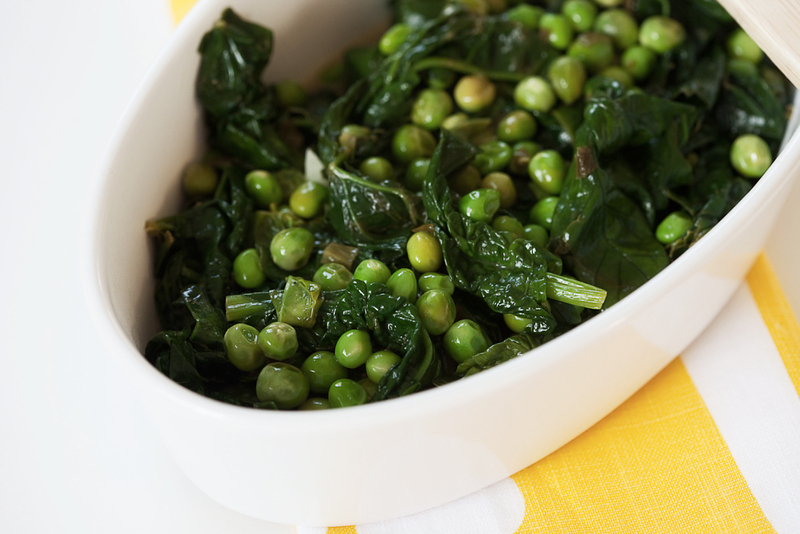 Tangles of earthy spinach play well with the sweet peas in this dish. The mild flavors are complimented nicely by the subdued bite of sliced garlic and a generous handful of scallions. Serve alongside a fillet of white fish dressed simply with lemon, sea salt and herbs for a healthy, feel-good-to-the-core meal. Heat olive oil and 1 tbsp butter in deep skillet over medium heat. Add the scallions and sliced garlic, stirring to coat with oil and butter. Let saute' for 2-3 minutes, not letting the garlic brown. Add the peas, and saute' for another 2-3 minutes, until the garlic starts to turn golden brown. Add the wine, and bring to a boil. Reduce to a simmer and allow to cook for another 2-3 minutes. 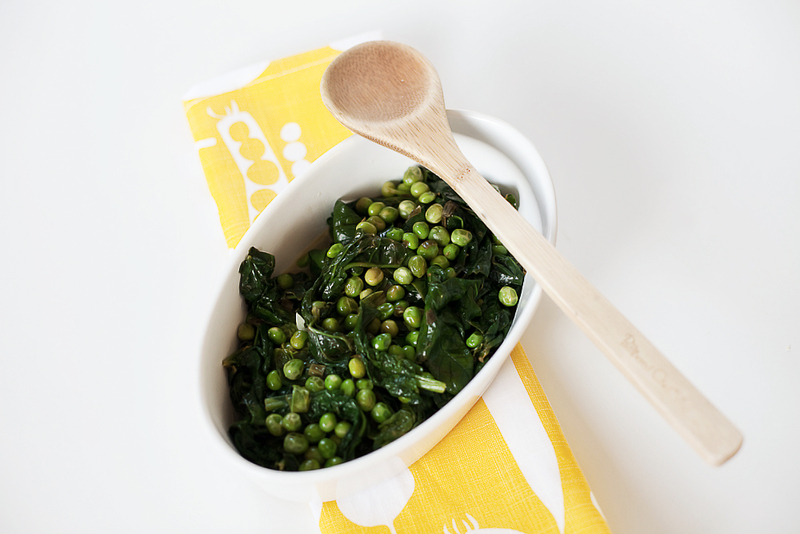 If using fresh peas, be sure to test one before adding the spinach to be sure that it is cooked. 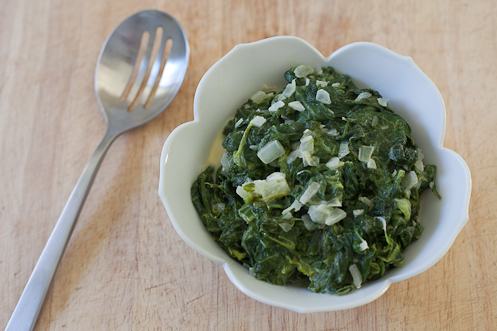 Add the spinach, stirring to coat with liquid. 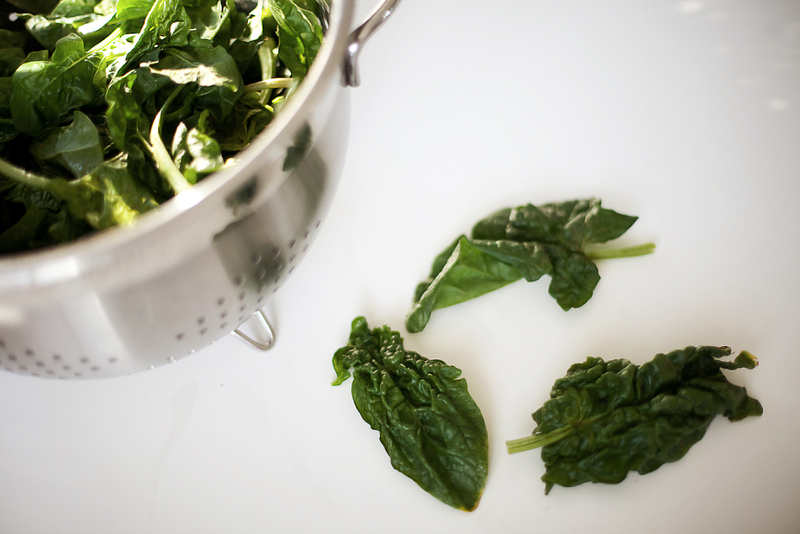 Allow spinach to heat through and wilt, 2-3 more minutes. Add last tbsp of butter and salt and pepper to taste. Last Saturday was the opening weekend for the 2010 Charlottesville City Market. I awoke bright and early that morning, positively giddy with excitement, ready to greet old friends and fill our basket with local meat, cheese, eggs, coffee and greens. I not-so-gently shook Brian awake, bounced down the hall to brush my teeth and tame my hair, pulled on jeans and slipped into sandals all in the amount of time it typically takes me to fumble around groggily looking for the ‘snooze’ button on my alarm. We arrived beneath a sky washed with shades of pink and blue, just as the cool morning air was pierced by golden sunbeams slipping between historic brick buildings. Our bodies cast long shadows on the sidewalk as we made our way towards the parking lot full of rainbow-hued tents, listening to the chatter of vendors and patrons mingled with the strum of a banjo and the bark of a dog. The intoxicating smell of sizzling, smokey breakfast sausage wafted our way as the folks from Babes in the Wood grilled plump links for the line of people curled around their booth, ready to get their fill of a market favorite missed for the last four months. We made our way down the already-crowded aisles, stopping to admire a booth of freshly cut tulips resembling painted Easter eggs swaying atop fluorescent green stems. Our first destination, always, is Double H Farm, where we're sure to receive a big bear-hug from Richard and a bright, happy smile from Jean. It was no different last Saturday, and even though we saw each other every few weeks through the long, cold Winter, we greeted each other as if it had been months since our last visit, all so excited that Spring is finally here and we'll be able to catch up every week. After a brief chat, our basket was filled with a dozen eggs, arugula, kale, sliced ham and a 6-pack of lettuce plants. Goodbyes were said alongside "see you next week!" and Brian and I moved on to explore the rest of the market. We stopped at the Shenandoah Joe booth for our morning cup of coffee and a pound of whole beans for the week, before moving on to Night Sky Farm for some samples of chevre and the purchase of fresh feta cheese. We wandered between booths, waving to familiar faces and introducing ourselves to new vendors, until finally our basket was filled to the brim and our wallets were empty. Once home I surveyed our purchases, planned our menu for the week and penned our grocery shopping list. I love this time of year, when local, seasonal produce begins to inform our meal choices, when the trip to the grocery store happens only after a visit to the farmer's market. Greens will play a prominent role in our diet for the next few months, until a greater variety of locally-grown produce becomes available. I'm okay with that, as it seems that there are endless possibilities for the leafy, fiber and vitamin-full vegetables. 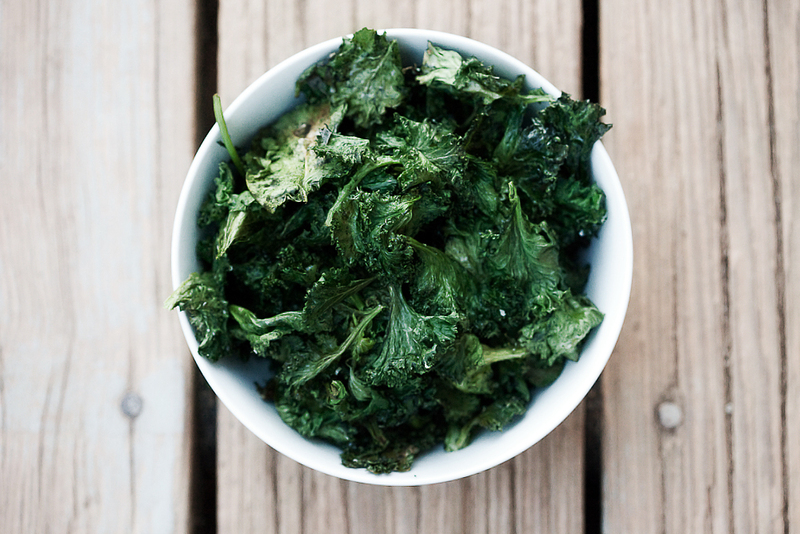 Last week we tried kale chips for the very first time, after seeing them pop up on many of my favorite blogs. 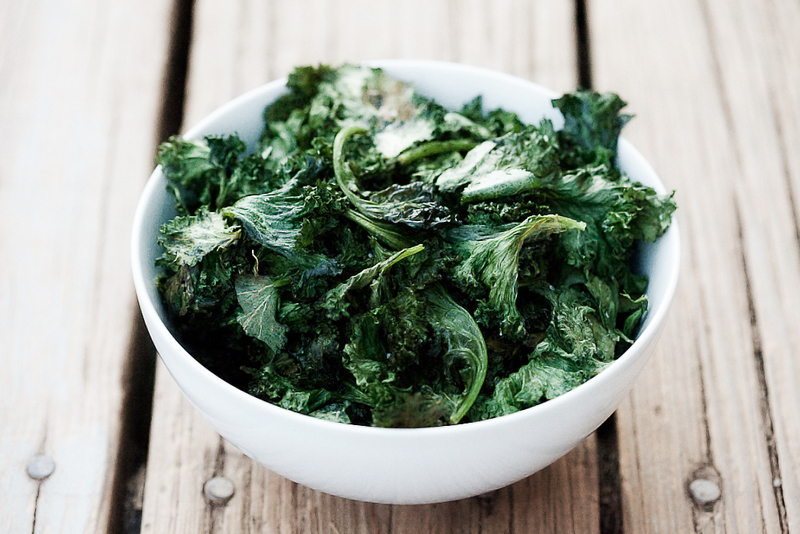 We used green curly kale and, although not as crispy as a potato chip, they were really quite tasty. Next time we'll try lacinato kale, as it seems that the thicker leaves will make for a more substantial chip. We also spread the baked kale across whole wheat pitas brushed with olive oil, and then topped the 'pizzas' with thinly sliced red onion and thick slices of fresh mozzarella. 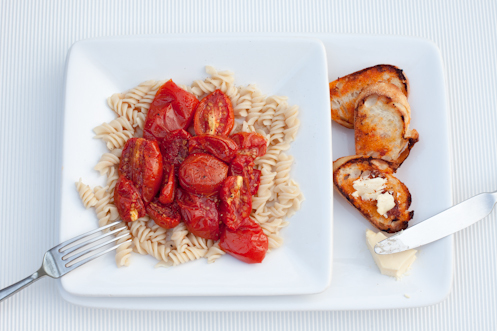 Delicious, and such a healthy, quick dinner. 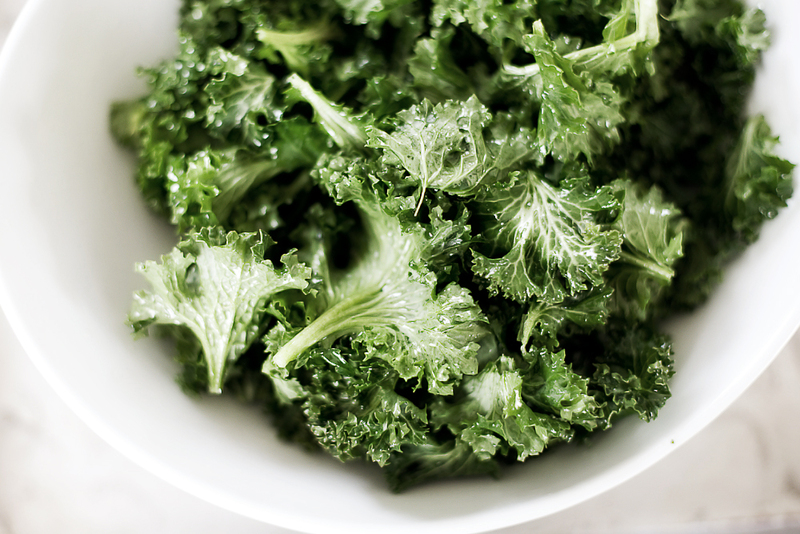 Rinse and dry kale as best you can with paper towels or in a salad spinner. Tear into bite-size pieces, discarding tough central stems. 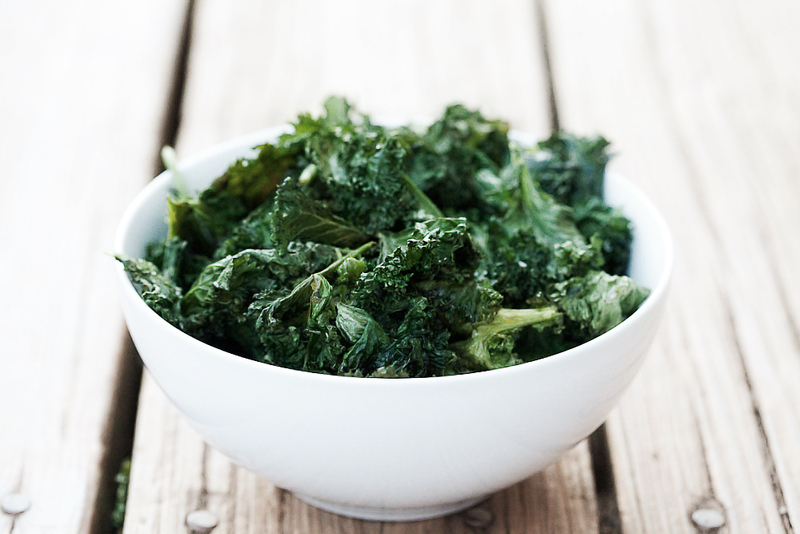 Toss kale with olive oil, just to coat very lightly. 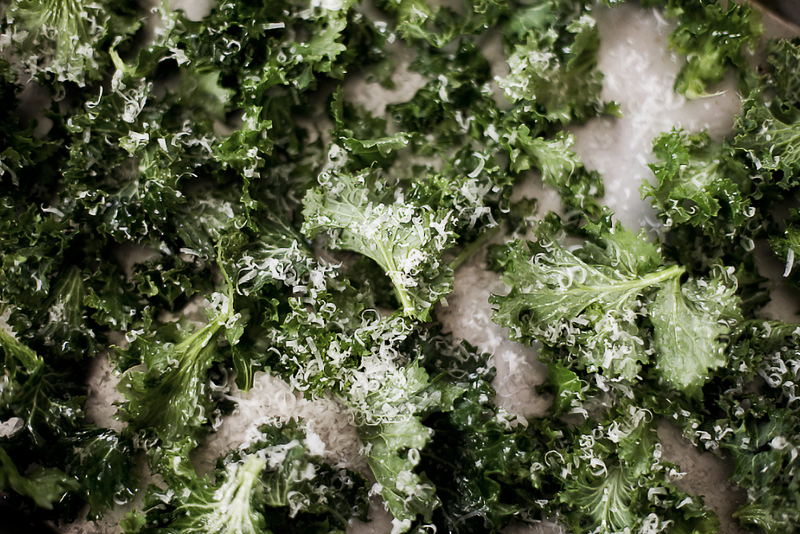 Spread kale across baking sheets in one layer. Sprinkle with sea salt and freshly grated parmesan. Bake at 350* for 10-15 minutes, until edges are starting to brown and kale gets mostly crispy. 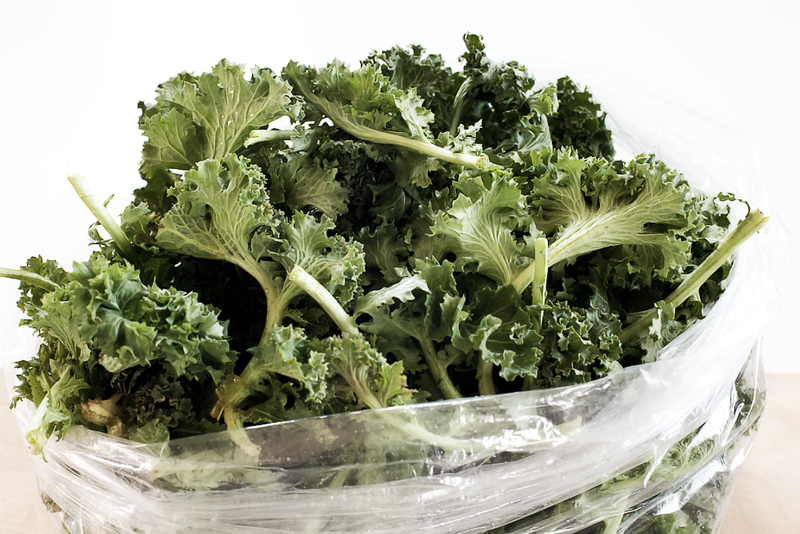 Remove from oven and remove from tray, laying kale chips out on a wire rack to cool slightly. Serve immediately. Our City Market lost someone very dear this week. John Coles, founder of the Virginia Independent Consumers and Farmers Association (VICFA), longtime food advocate and producer of incredible, artisanal goat cheese, has passed away. His presence at the City Market and as a member of the local food community will be missed greatly. You can read Joel Salatin's tribute to John here. Winter and I have had a rocky go of it this year. We’ve waffled back and forth in a love / hate relationship that rivals the one I’ve currently got going on with my gym membership. On one hand, I’ve loved the quiet beauty a good snowstorm lays gently across my world and the resulting desire to cozy up on the couch with a hot cup of tea and a season of Entourage. On the other, I am tired of feeling stuck indoors, the outside ice, mud and frigid air enough to keep me hibernating under a quilt with the lights turned low. The result has been a bit too much cozying, and my motivation to cook, write, or log miles on the treadmill seems to be hiding in the same dark place as the sun. I am lost in the monotony of February, floating through scenes of white and gray, desperately seeking a reprieve in the form of a warm day, tiny chartreuse buds on the backyard Maple tree, fresh produce from local farmers that isn’t squash or cabbage. There have been some brighter moments lately, a few shrieks of excitement released from my heart after witnessing the sun pierce a hazy layer of clouds, revealing a small patch of brilliant blue sky. I was thrilled to notice last week that two copper-toned birds have chosen to make a nest in the cold, drab ally outside my office window, and just this morning heard a woman excitedly discussing the yellow crocuses popping out from under a blanket of snow in her yard. All are sure signs of Spring’s impending arrival and moments I am desperate to capture permanently. Should snow fall again in the coming weeks I’d like to have a photograph stashed away in my back pocket to remind me that the end is near, that productivity will return with a sunshine-filled sky and baby birds chirping on the sill. In the meantime, the meals I am managing to cook seem to have several similar qualities. They are simple. They are hearty and warm and filling. 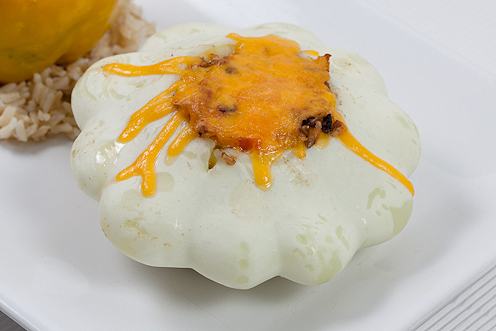 They incorporate some ingredient that brightens the dish at multiple levels; to the eyes, to the nose, to the tongue. Whether it be golden citrus tossed in a salmon salad, vibrant leeks bobbing amongst emerald isles of kale, the scent of fresh lime wafting from my oven, each recipe is very carefully chosen to lift our spirits and carry us through these last (25!) days of Winter. This salad is no exception to my new rules. 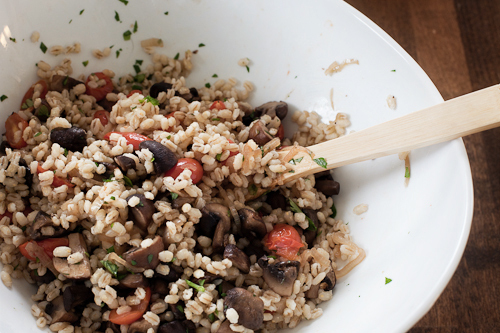 Hearty grains are joined by warm, earth-scented mushrooms to create a salad base as warm and satisfying as a family quilt enveloping shivering shoulders. Jewel-toned grape tomatoes and bright flecks of fresh parsley are the harbingers of this dish, reminders that Spring, followed closely by Summer, will be joining us soon. Served over a bed of spicy arugula and layered with shavings of Pecorino Toscano, this salad makes for a lovely, filling, early dinner, and is best enjoyed beside a window in the rays of Winter's setting sun. Move an oven rack to the middle position and heat oven to 425*. 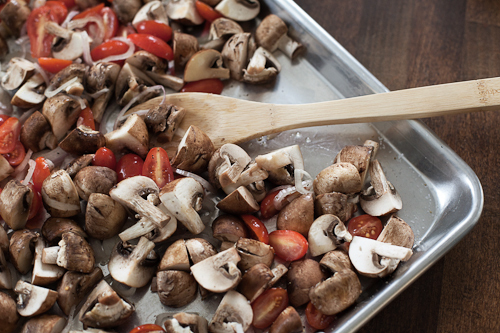 Toss the mushrooms, tomatoes, shallots and 2 tbsp of the oil together on a rimmed baking sheet. Season with salt and pepper to taste. 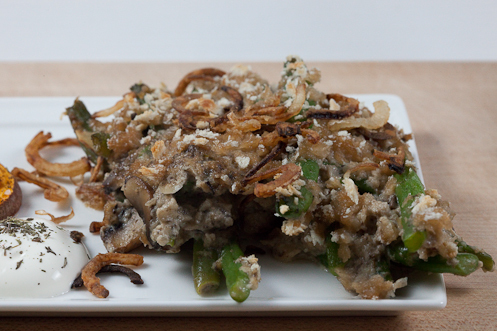 Toast the veggies, stirring once, until the mushrooms and shallots are browned nicely, about 25 minutes. Let cool slightly. Meanwhile, bring water, barley and pinch of salt to a boil in a large saucepan. Reduce the heat, cover and simmer gently, stirring occasionally, until the barley is tender but still a bit chewy, about 30 minutes. Drain the barley well in a strainer and transfer to a large bowl. Toss the barley with the remaining 3 tbsp oil until coated evenly. Add the roasted vegetables and parsley and toss to combine. Cool slightly and then season with salt and pepper to taste. Divide the arugula or spinach among four large plates. 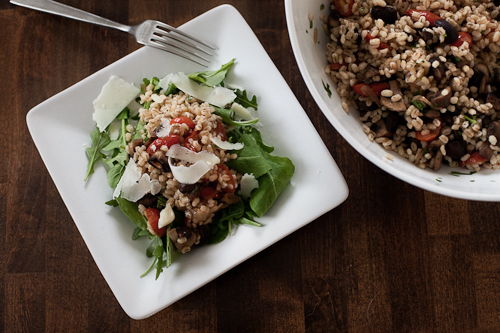 Spoon warm barley salad over each plate, sprinkle with cheese, and serve. 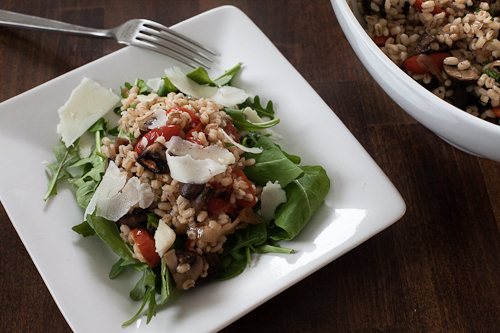 Store barley salad separately from arugula or spinach and reheat for lunch the next day, if desired. After all of the indulgent foods that we consumed between Thanksgiving and New Year's Day, Brian and I have been more than ready to get back into our typical, mostly healthy*, eating routine. 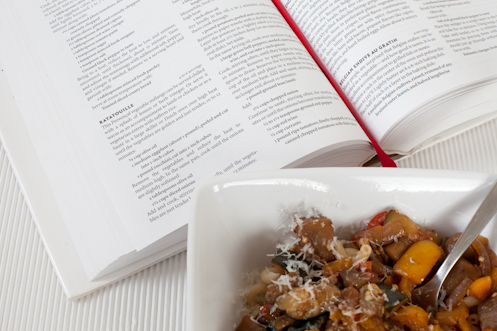 We've bookmarked page after page of easy-to-prepare, full-of-veggies, yet still homey and comforting meals in some of our favorite cookbooks, and also in some new titles gracing the bookshelf. It is my hope that the month of January on Bella Eats will help all of us to get back on track and break our dependence on cheese plates before and dessert after most meals, as lovely as that may have been. *To be clear, Brian and I believe in non-restrictive eating and the idea that nothing is off limits as long as moderation is practiced. So don't be surprised when small amounts of butter, cream, bacon etc. still appear in the lists of ingredients for recipes that claim to be healthy. Balance is key to a healthy diet, and we strive to prepare meals that are full of flavor and satisfying so as not to feel deprived of something that is important to us - delicious food! Whenever I feel off-track, out of balance, the need for a healthy meal after weeks of parties and holidays and travel and restaurants...I turn to dark greens. 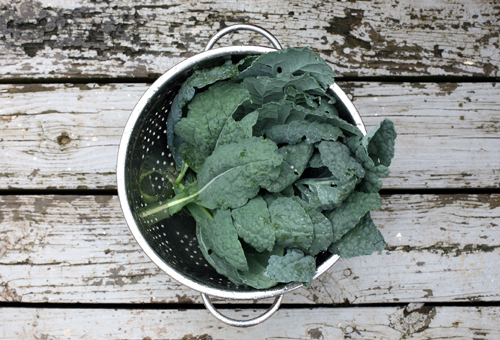 Full of nutrients and flavor, the consumption of a heaping pile of kale, collard greens, swiss chard, mustard greens or spinach as a side dish or addition to soup or salads has me instantly feeling like myself again. 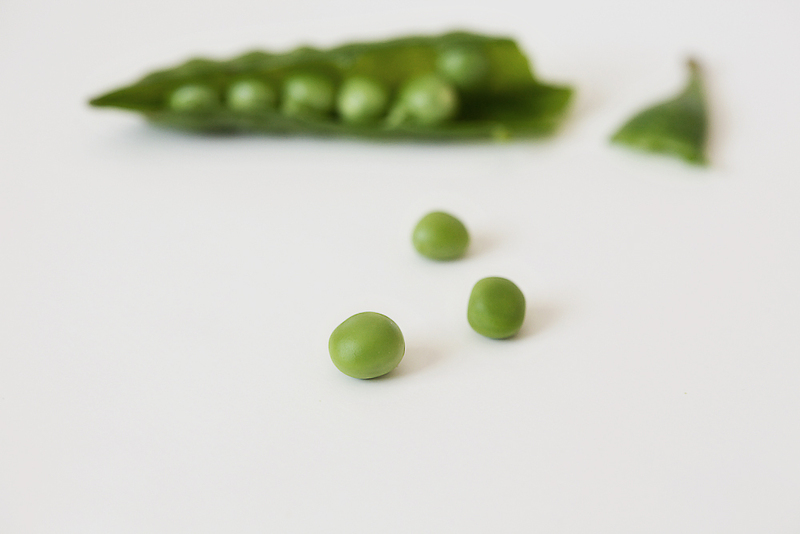 The most common preparation for us is to simply saute' any of the above greens with extra-virgin olive oil and garlic, finishing them with a light drizzle of balsamic vinegar or lemon juice and a sprinkle of sea salt and freshly-ground pepper. Occasionally though, I'll have the desire to try something different, such as when our friends gave us a heaping pile of mustard greens from their garden just before the big snowstorm hit in December. 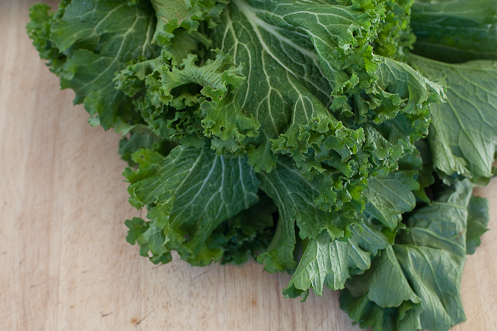 Mustard greens have a spicy, peppery taste, and these particular greens were especially flavorful. We'd sauteed some in our typical fashion and, while still enjoyable, the spiciness was on the verge of being too overwhelming for us. I turned to Vegetables Every Day for an alternative method of preparation (our go-to book for veggies, always) and was so pleased with the result of my search. The creamy sauce and sweet onion tempers the spiciness of the greens but still allows their mustardy flavor to shine through. I could have eaten the entire bowl-full as a meal on its own. Brian and I enjoy greens on the side of many dishes, but a recent discovery has been the deliciousness of greens on top of one of our favorite meals, sausage with peppers and onions. We stocked up on pork sausage from Double H Farm to get us through winter, and will throw a few links on the grill for a quick and tasty lunch or dinner quite often. 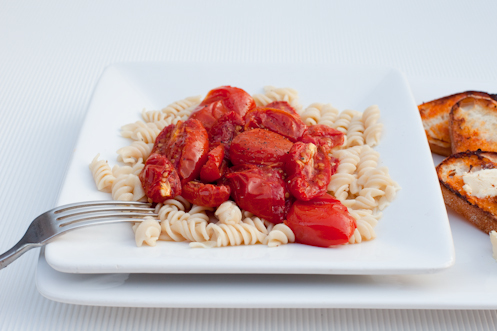 Saute' red bell peppers with sweet onions in a bit of olive oil and garlic until tender. 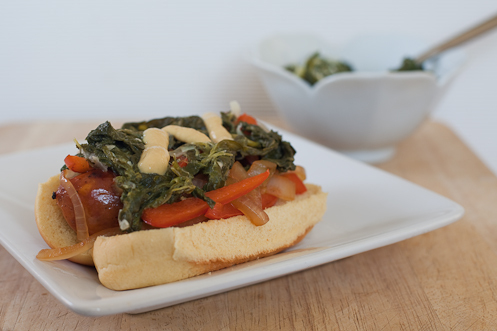 Serve sausage on a bun (whole wheat, for a healthier alternative) topped with peppers and onions and a generous helping of these greens. Add extra Dijon mustard if you're as big a fan as we are. Bring 4 quarts of water to a boil in a large pot. 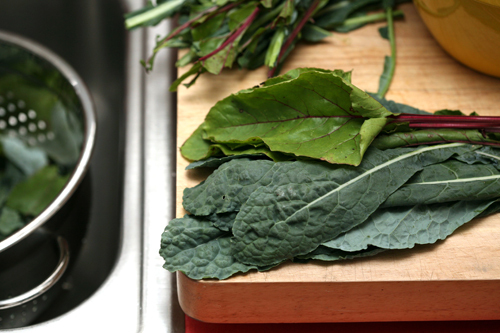 Wash the greens in several changes of cold water, then strip off the leafy green portion from either side of the tough stem. Discard the stalks and rip the leafy portions into small pieces. Add the greens and 1 tsp salt to the boiling water. Cook until the greens are tender, about 8 minutes. Drain well. Melt the butter in a large skillet. Add the onion and cook over medium heat until golden, about 5 minutes. Add the greens and toss to coat with the butter and onion. Season with salt and pepper to taste. Whisk the cream and mustard together in a small bowl. Add this mixture to the skillet and cook just until the greens absorb some of the sauce, 3 to 4 minutes. Adjust the seasonings and serve immediately. Across the country cookbooks and magazines have been poured through, pages dog-eared and marked with post-it notes of all colors as folks finalize their Thanksgiving menus. Lists are made, non-perishable foods have been purchased and trips to the grocery for fresh veggies and dairy products have been scheduled. 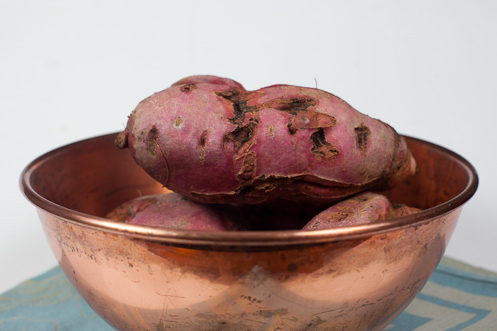 Sweet potatoes are tucked away in dark pantries, waiting for hands to scrub, peel and cube them to boil, roast, mash or bake on Thursday. 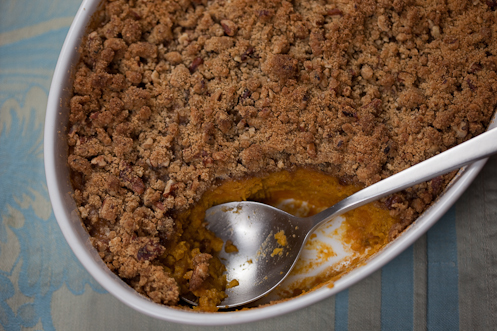 Growing up, sweet potatoes were never an exciting part of our Thanksgiving menu. They made the occasional appearance and never left much of an impression on me. Brian and I have hosted Thanksgiving twice now since being married, and only once have they made it on our table after a guest offered to bring them with her to dinner. Its not that I have anything against the orange-fleshed tuber, in fact I purchase them throughout the year to eat baked and topped with steamed broccoli, kernels of plump corn and a generous sprinkle of sea salt. Its just that, traditionally, I enjoy them in savory form rather than sweetened as they are in most Thanksgiving recipes. Not wanting to give up just yet, I decided to give sweet potatoes a try again this year. Originally I planned to find a savory recipe to test, but elected instead to give a sweet recipe another shot; to stick with tradition for at least one more year before abandoning the concept entirely. My momma sent me a classic version that she insisted I had liked in the past, one that she assured me was much more enjoyable than the soupy, marshmallow-topped dishes I described from my own memory. 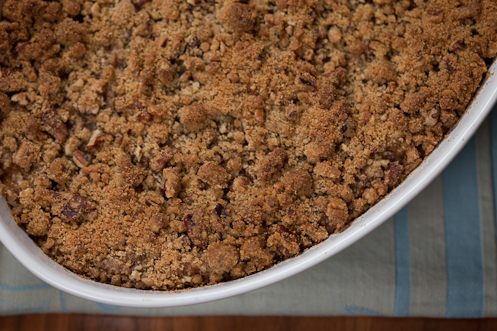 The potatoes are boiled, mashed, whipped and sweetened, then smothered with a crumbly streusel-like topping before being baked until golden brown. The result is neither soupy nor pasty, is in fact pleasantly fluffy with the contrasting crunch of sugared pecans. 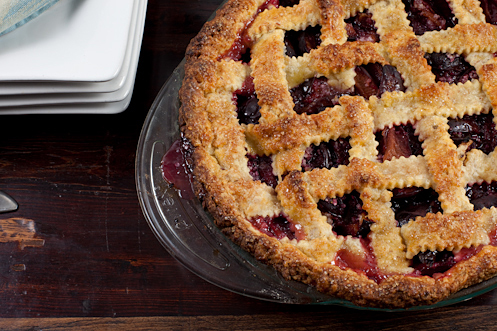 It is quite sweet, so much so that I would probably categorize it as a dessert rather than a side, although my momma tells me that when paired with other savory bites on a Thanksgiving plate it is altogether balanced. No matter when it is served, this casserole deserves a place at the table. 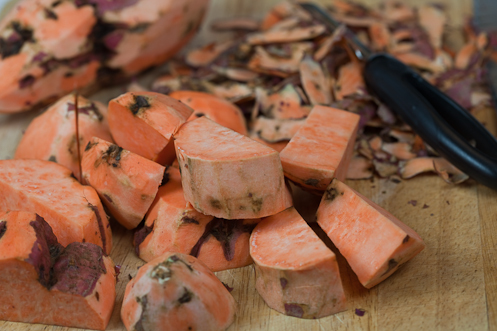 If using raw sweet potatoes, peel them as best you can and chop them into small chunks. Boil for 10-15 minutes until potatoes are tender but not falling apart. Mash until nearly smooth. Mix in eggs, butter, cinnamon, brown sugar and salt. Add cream slowly and blend until fluffy (use whisk attachment if using a stand mixer), stopping before potatoes become soupy. 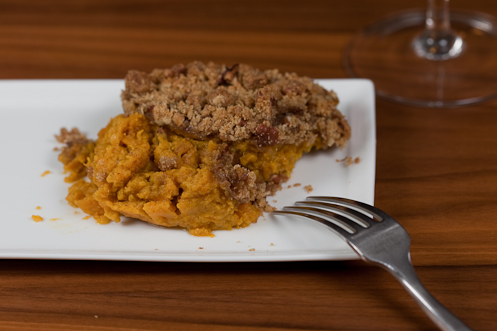 Spoon sweet potato mixture into a greased 9x13 baking dish. Preheat oven to 350*. Mix together topping ingredients in a small bowl. Spread over sweet potato mixture. Bake for 50-60 minutes, until topping is deep golden brown. A very Happy Thanksgiving to all!!! Our family and very close friends, all of whom are so incredibly supportive of Brian and I. My employers, for pushing through and doing all they can in a difficult time. Brian, my love, who always knows how to make me smile when things get tough. What, or who, are you thankful for this year? In a large, wide saucepan set over medium heat, melt the butter. Add the remaining mushrooms and turn the heat up to high. Cook while stirring often, until the mushrooms release their liquid and start to crisp at the edges. Add garlic and thyme and stir for about 30 seconds. Add mushroom-onion paste and reduce heat to medium-low. Cook, stirring constantly, for about 10 minutes. Add cream and stock, and salt and pepper to taste. 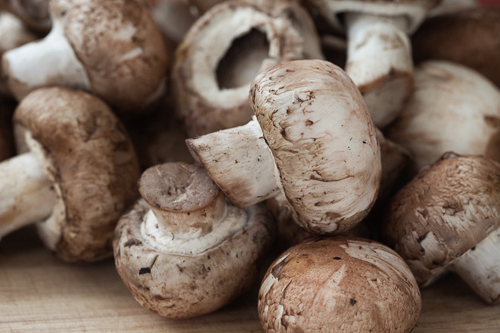 At this point the mushroom mixture may be cooled and refrigerated for up to 24 hours. Bring a large pot of water to a boil, and fill another bowl with ice water. Drop the green beans in the boiling water and cook until bright green and just tender, about 60 seconds. Drain and immediately plunge the beans into the ice water. Drain well. Preheat oven to 375*. 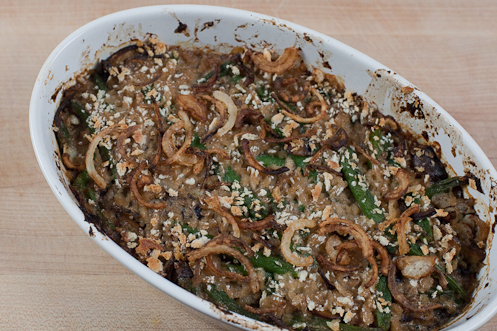 In a large bowl combine green beans, mushroom mixture, almonds and 1/4 cup of the bread crumbs. Transfer to a 9 x 13 baking dish and pack down the mixture to level it. Sprinkle with the remaining 1/4 cup of bread crumbs. Bake, uncovered, until beans are tender and top is lightly golden, 35-40 minutes. If you wish, place under the broiler for the last couple of minutes to really crisp the top. To garnish, heat oil in a non-stick skillet until it shimmers. Place flour in a mixing bowl and season with salt and pepper. Add sliced pearl onions, toss to coat and fry in oil until golden, 30-45 seconds. Drain on paper towels and sprinkle on finished casserole. 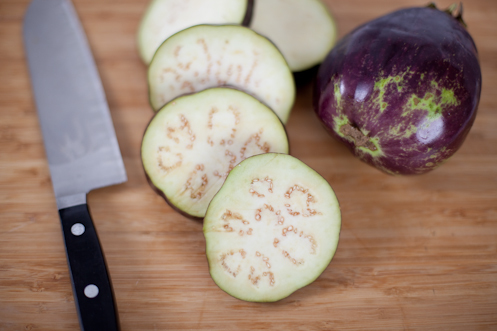 After peeling and chopping your eggplant, place it in a colander and sprinkle with course sea salt. Let sit for 30 minutes to release some of the liquid, rinse well and pat dry. Remove the vegetables from the pan and reduce the heat to medium-high. 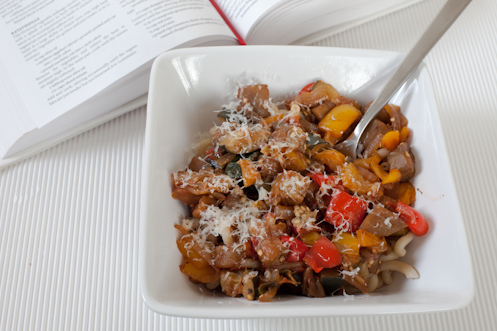 Drizzle in the 2 tbsp of olive oil and add the onion and bell pepper. Cook for 8-10 minutes until the veggies are just tender but not browned. Season with salt and pepper to tasted. Add tomatoes, thyme and bay leaf. Reduce the heat to low, cover, and cook for 5 minutes. Add the eggplant mixture and cook until everything is tender 10-20 minutes. (Again, this depends on your veggies. 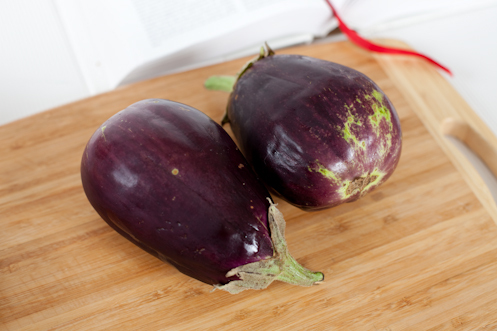 You want the eggplant to be silky but not falling apart, and the other veggies to be tender but not mushy.) Taste and adjust your seasonings. 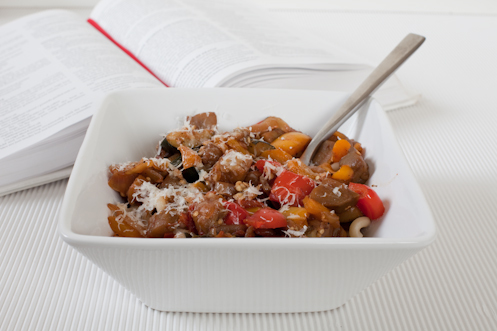 * We decided after this go-round that the ratatouille could be improved with the addition of some red pepper flakes. I'd add about a 1/4 tsp, depending on your tastes, when you add the onion and bell pepper to the pan. * Another possibility, if you're not a fan of spicy food, is to add capers. I had a bruschetta recently with eggplant, onion, tomato and capers that was absolutely delicious, so think they'd be lovely in the ratatouille as well. I'd start with a tablespoon, added with the tomatoes, and add more if you feel it is necessary. For Peppers: Cut the tops off of the peppers. Cut out the interior ribs and remove all seeds. 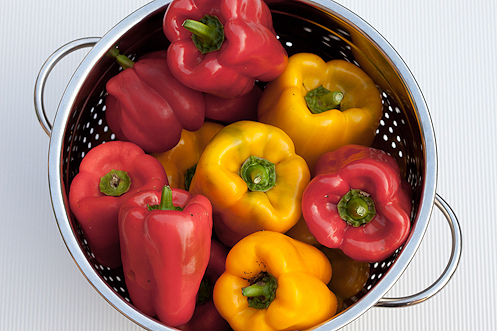 Bring a large pot of water to a boil, and drop the peppers in so that they fill with water. Boil for 1-2 minutes, until the peppers are starting to soften and turn a brighter shade of yellow/red/green. Remove from water, drain and set aside. 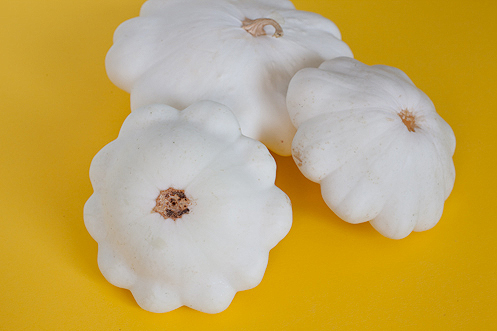 For Squash: Cut tops off of squash as you would a pumpkin. Scrape out interior seeds and strings, discard. Bring a large pot of water to a boil, and drop the squash in. Boil for 5-8 minutes, until the squash is fork-tender. Remove and drain, set aside. 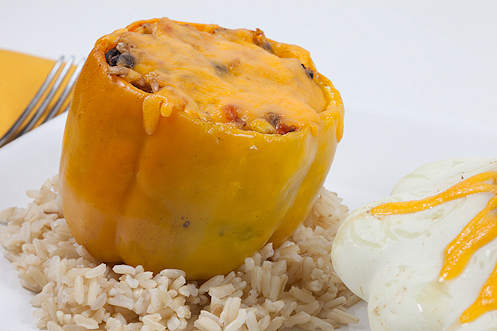 In a medium-size bowl, mix together the cooked rice, corn, red onion, diced bell pepper, and roma tomatoes. Drain the beans and press or squish with your palms before adding to the rice mixture (some beans will remain whole, but most should be squished). Add cumin, chile pepper, salt and pepper, mix well. Add 1/2 cup cheese and set aside. 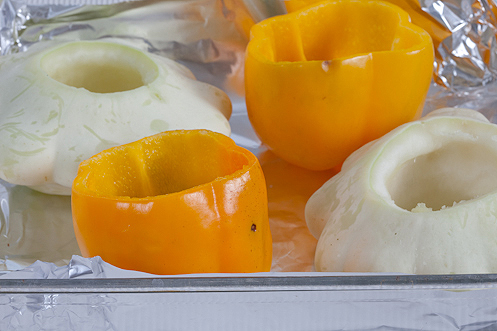 Line a baking dish with foil and set peppers or squash in dish. Fill with rice mixture until full, and sprinkle top with cheddar cheese. Bake at 400* for 20-25 minutes, until cheese is bubbly. Turn on broiler for last minute or two if you want to brown the cheese a bit. Remove from oven and let cool for a few minutes before serving on a bed of rice. Move rack to top of oven. Turn broiler on hi. 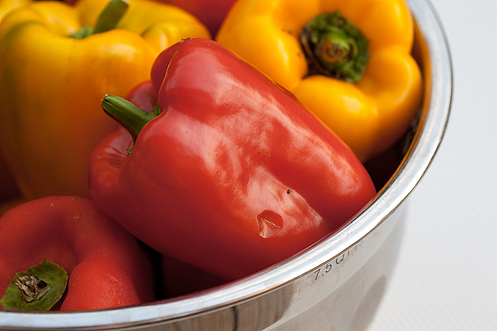 Place peppers in a baking dish. Place under broiler and broil until all sides are charred, turning accordingly, for 3-5 minutes. (See photo on left below for peppers just after charring). Remove and turn off oven. Put hot peppers in a gallon-size ziplock and seal. Let "sweat" for 30 minutes in bag. After 30 minutes, remove peppers from bag. Skin should be easy to peel from peppers - remove it all. Cut a slice in one side of each pepper and remove all ribs and seeds from interior. IMPORTANT - If you are sensitive to heat, make sure to remove ALL of the ribs as this is where the heat lies. Also WASH YOUR HANDS many many many times with soap and water before touching your eyes, nose, mouth etc. 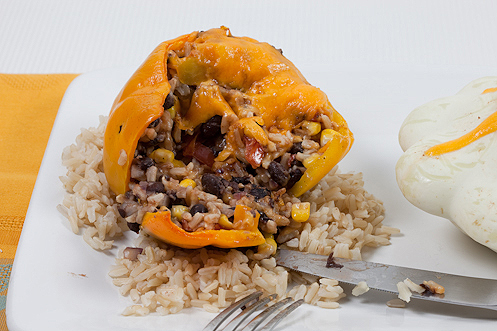 In a medium-size bowl, mix together the cooked rice, corn, onion, diced bell pepper, and roma tomatoes. Drain the beans and press or squish with your palms before adding to the rice mixture (some beans will remain whole, but most should be squished). Add cumin, salt and pepper, mix well. Add 1/2 cup cheese and set aside. This weekend, Brian and I are off to Brooklyn for a childhood friend's (mine) wedding. We are so excited, even though we'll only be in the city for about 48 hours. As with all of our vacations, we are planning this one entirely around food (except for the wedding of course, but the lovely bride has Baked! catering the desserts!!!). If you have any suggestions for your favorite foodie havens in Lower Manhattan and Brooklyn...send them on! And expect a full photographic review of our trip next week...! 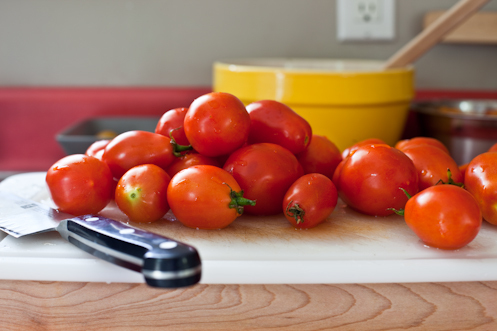 Wash and dry tomatoes, and cut them in half length-wise. 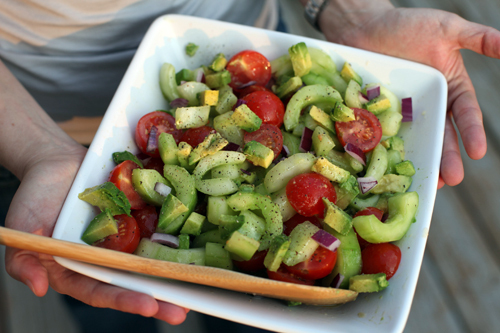 Place in a large bowl and drizzle with olive oil. Toss gently to coat. 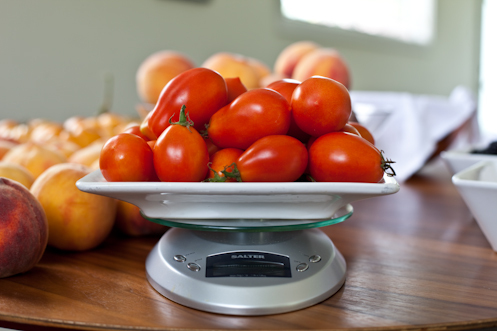 Arrange them on a baking sheet cut-side up, and sprinkle each with a pinch of salt and a pinch of coriander for every 4-6 tomatoes. 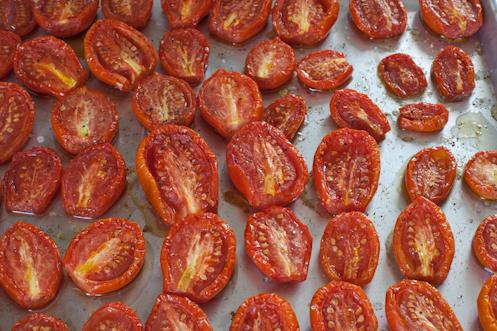 Bake until the tomatoes crinkle at the edges and shrink to about half their original size, 4 to 6 hours. Cool to room temperature before storing them in an airtight container. They will keep in the refrigerator for up to a week or the freezer for a few months. 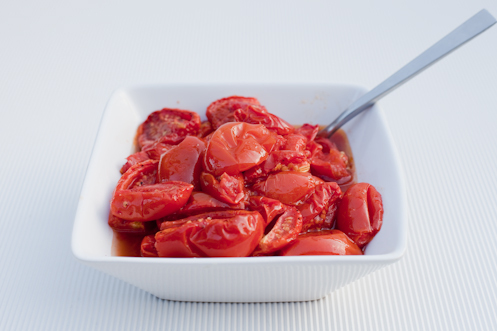 **I also found this slow-roasted tomato recipe that I wanted to try, but we ran out of tomatoes in the garden too soon. I may pick some up at the market this weekend to give it a try. 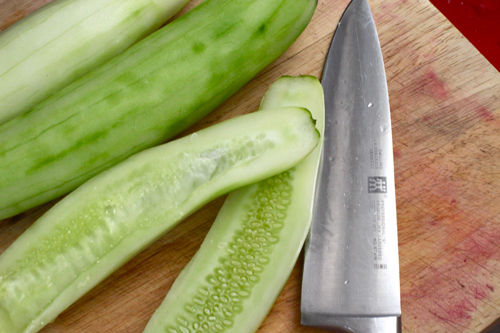 Peel cucumbers and slice them in half length-wise. 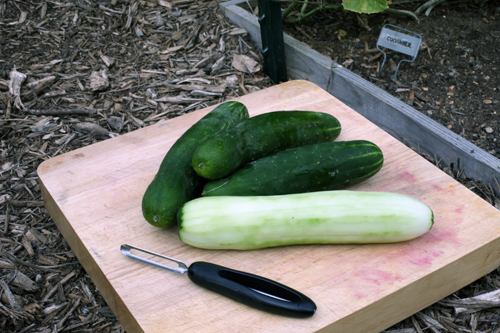 Scoop seeds out with a spoon and cut cukes into 1/2-inch slices. Place cukes in colander in sink and sprinkle with kosher salt. Toss to coat and let sit for 30 minutes before rinsing very well. Combine vinegar, honey, shallot, mustard and garlic in food processor. Slowly add olive oil and process until smooth. Salt + pepper to taste. 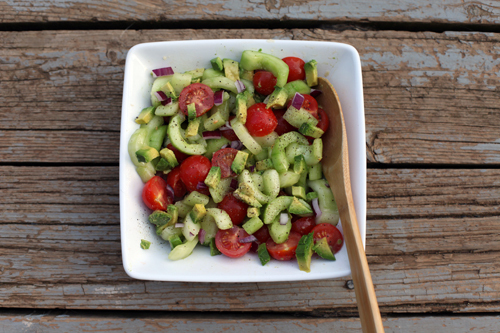 In a large bowl, toss rinsed cucumbers, red onion, tomatoes, avocado and cilantro together. Add dressing to taste. You will have dressing leftover, and it should be used within 1 week. Preheat oven to 350*. 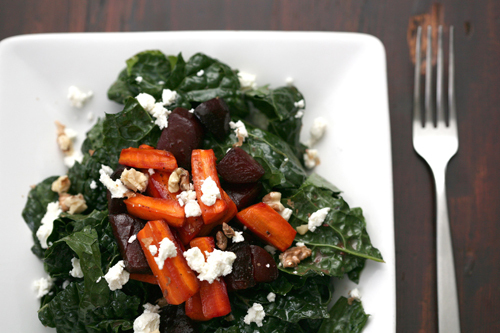 Place chopped beets and carrots into medium-size glass baking dish. Drizzle with olive oil and sprinkle with salt and pepper, stir to coat. Roast vegetables for 30-40 minutes, until tender but not mushy. Wash and dry greens as best you can. Remove leaves from stems and chop to bite-size pieces. Place in large bowl and toss with raspberry vinaigrette to coat well. Remove vegetables from oven and allow to cool for 10 minutes. While they cool, toast your walnuts. 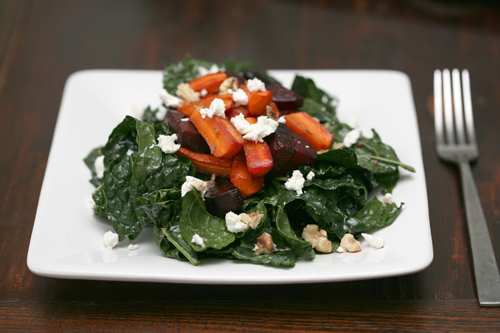 Place a heap of greens in the center of your plate. 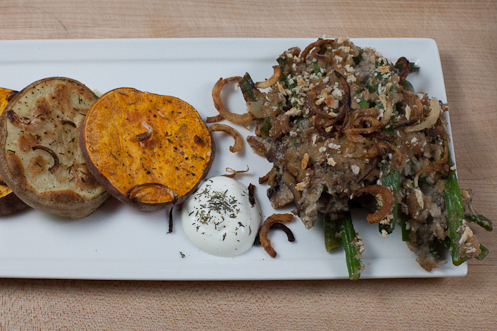 Top with roasted vegetables, crumbled goat cheese and toasted walnuts. Even though we've only lived here four years, Brian and I have fallen completely in love with Charlottesville. 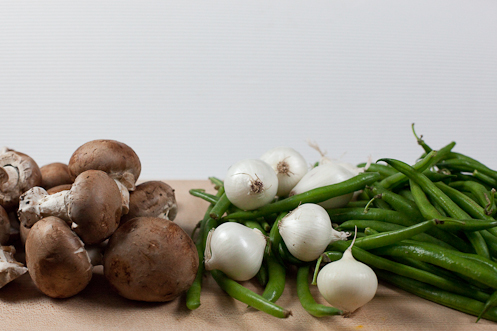 One of the things we enjoy most about this little city is the strong local food movement. We visit the farmer's market each weekend during the season to gather our meat, eggs and produce for the week (whatever we're not growing in our own garden) and have long conversations with our favorite farmers. We get to see photographs of the chickens who lay our eggs pecking the ground in their grassy field, the cows and their new calfs, and the bee hives housing the bees that are pollinating the plants from which our vegetables grow. It is undoubtably our favorite part of the week, and we make sure to leave ourselves with plenty of time to talk to Richard about the problems we are having with our own tomato plants and to gush to Jean about the magic of her hens’ eggs. We have a direct connection to the people who supply the food on our table, something that I think the majority of the world population doesn’t have and may not understand. 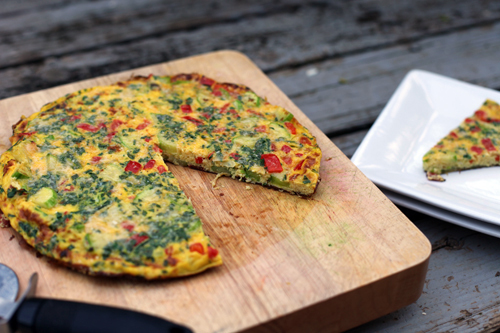 I know that we're very fortunate, and was reminded of it again last week when I made this vegetable frittata. As we sat down to eat I realized that every single ingredient, except for the parmesan cheese and olive oil, was locally grown. The eggs, milk, bell pepper, leeks and zucchini all came from the farmers' market, and the herbs were grown in our own garden. How cool is that?!? I'm not trying to rub it in, I'm really not, I just had to share with you all the amazing feeling that I had knowing that our dinner was not only delicious, but also supporting our local farmers. With Food, Inc. just out (which I haven't seen yet, gasp!) I've read a lot more chatter in the food blog world about being aware of where our food comes from. Its exciting, and I'm so glad to see bloggers with serious readership and influence supporting the cause. To join in, I wanted to share a couple of sites I've recently read about that may help you discover local food providers in your area. And, for my Charlottesville readers, I've added a new local page to the top bar. I know that I am probably missing a lot of great resources so if you have any to add, please leave a comment! Whisk together eggs, salt, pepper and yogurt or milk until smooth. Add minced herbs and stir well, set aside. Heat oil in 10 or 12 inch nonstick skillet over medium heat. Add bell pepper, zucchini and leek. Cook for 8-10 minutes, until veggies are tender. Increase heat to medium-high. Pour egg mixture over veggies evenly. 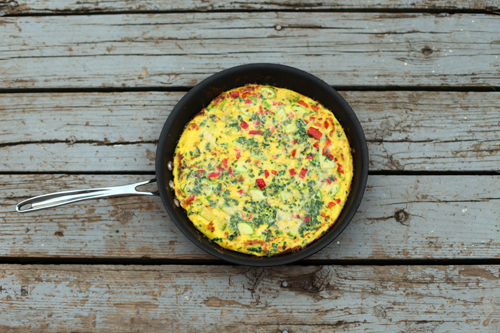 Cook on medium high for 3-4 minutes, tilting pan and lifting edges of frittata to allow raw egg to run underneath. Lower heat to low, cover pan and cook for an additional 8-10 minutes, until frittata is mostly set. Shake pan occasionally while cooking. Meanwhile, place a rack at the top of the oven and turn broiler on to high. 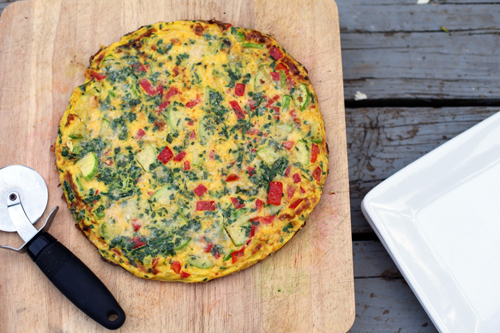 Remove frittata from stovetop when it is mostly set. Sprinkle cheese across top and place in oven, under broiler. Broil for 1-2 minutes, watching carefully to not let it get to brown. You just want a few spots of brown across the top, and bubbly cheese. Remove from the oven and allow to cool in pan for about 5 minutes. 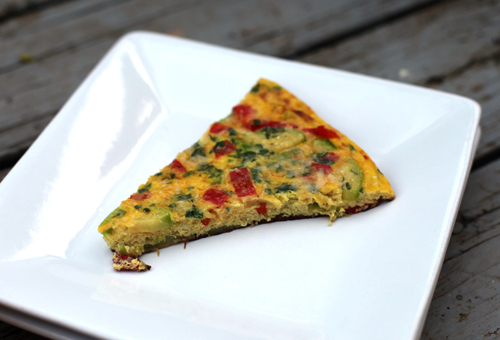 Remove to cutting board or large plate, cut into wedges and serve.